CSDPrint has been producing posters for over 30 years. Underpinning all that hard-earned knowledge, is some of the latest large format digital printing technology on the market. This means that we can print a huge range of posters, to the very best quality, quickly and cost-effectively. Customers who frequently order posters from us include retailers who use them for window and in-store displays. We also supply a large number of car dealerships with posters for their showroom and forecourt advertising. Posters are perfect for retailers as they are very cost-effective and can be easily changed in-line with new promotional campaigns. Schools and higher education marketing teams also come to us for their poster graphics, again the need to regularly change and update displays is an important factor in choosing this type of large format printing. Other sectors that we print promotional posters for include estate agents and manufacturing companies. All of our posters are printed using the highest grade large format printing materials. 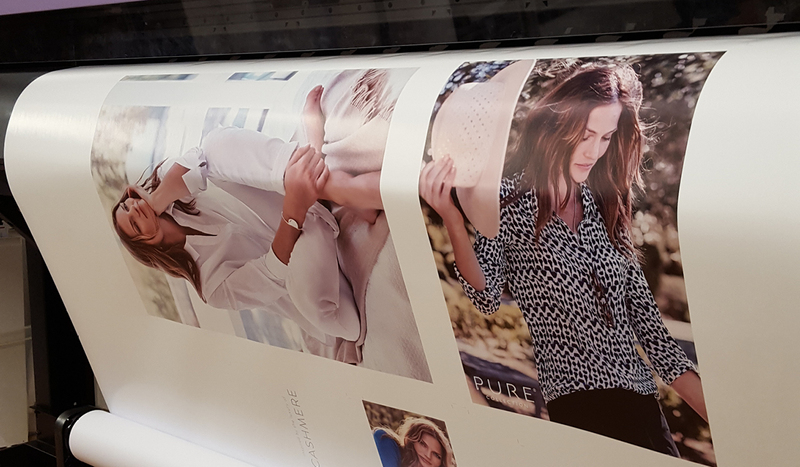 Large format poster printing is one of our specialisms, we produce all standard A-sizes as well as custom sizes such as 4 sheet (60 x 40 ins) or 6 sheet (47.24 x 70. 86 ins). Lots of our retail clients suspend posters from wires or cords in the windows of their shops. These very large format printed graphics are ideal for displaying photo quality images of your products. As well as store windows, smaller hanging posters are very light and can easily be hung from ceilings. You’ll also see posters applied directly to the inside of windows in car dealerships, shopping centres and tourist attractions such as museums and galleries for example. We supply suckers which make your window posters really easy to display. If you would like to have your posters a bit closer to the ground then they can be fitted into free-standing snap frames or sandwich board-style A frames. These simple display devices are great for standing your advertisement on the pavement, forecourt or in the aisle of a shop right in front of your customers. We also supply posters for frames that can be wall mounted for example those used in corridors at schools, colleges, universities, factories and office blocks. These frames are front opening so your large poster graphics can easily be changed.